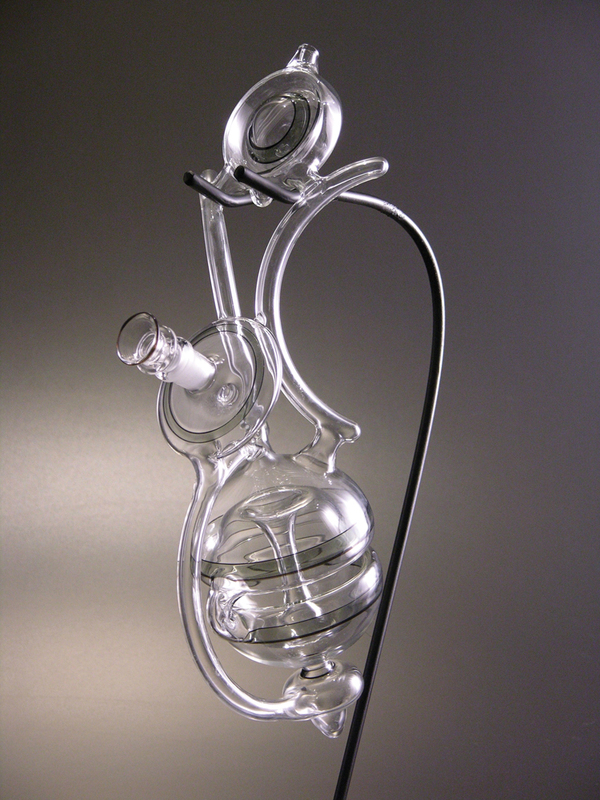 Some consider Micah Evans’ glass pipes novelties, but he treats them with sculptural seriousness. Published on Monday, February 19, 2018. This article appears in the February/March 2018 issue of American Craft Magazine. Micah Evans is used to receiving sideways glances. 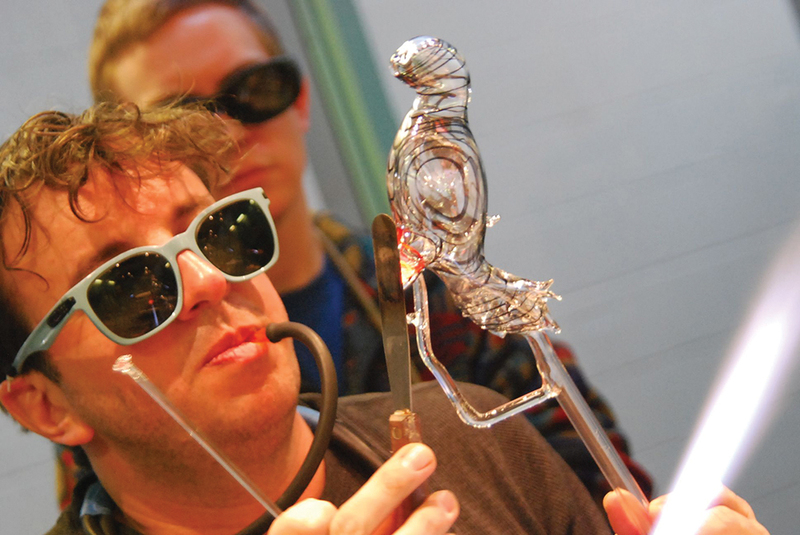 The 42-year-old glass artist has been a part of some of the most respected craft institutions in the country, from Penland School of Crafts to the Corning Museum of Glass, but the object he is most associated with is still, in some circles, taboo. 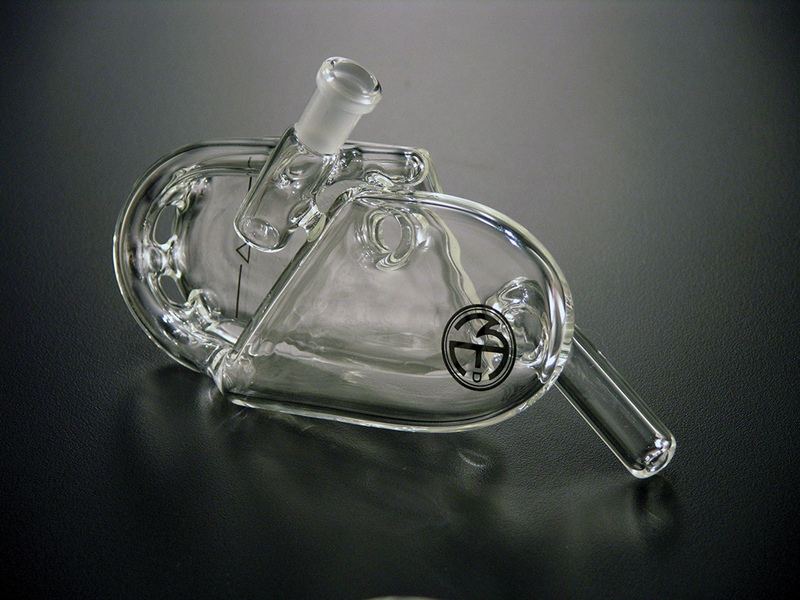 Evans makes marijuana pipes, and his stock-in-trade hasn’t always endeared him to the more strait-laced members of his community. It was no surprise to Penland’s officials that their new artist-in-residence made drug paraphernalia; “they had Google,” he points out. But his pipes stand up to scrutiny, combining structural sophistication with bold flourishes and striking colors. They look, at times, like compact mazes, full of compartments and channels and trap doors. They fold and bend in on themselves, leaving user and observer alike to wonder how they work. Evans’ sculpture helped lead to the Penland residency and a teaching position at Corning, among other accomplishments, while his functional pieces help pay the bills. (Evans estimates that 70 percent of his income comes from functional wares; “I try to keep money out of the fine art side,” he says.) 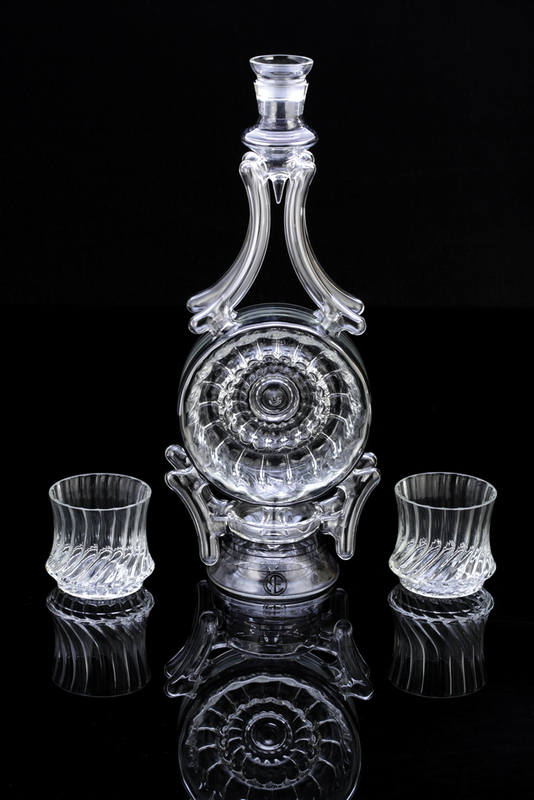 In recent years, his work in what he calls “niche vice markets” has expanded to include high-end liquor bottles and decanters. Like his pipes, these are the product of an attentive eye and a keen scientific mind, and sometimes include features such as aeration systems. He sells his pipes and bottles at shows across the country, which he advertises on his popular social media accounts. No simple stem and bowl will do for Micah Evans’ pipes. Flat (2014) combines a smooth surface and jutting angles. 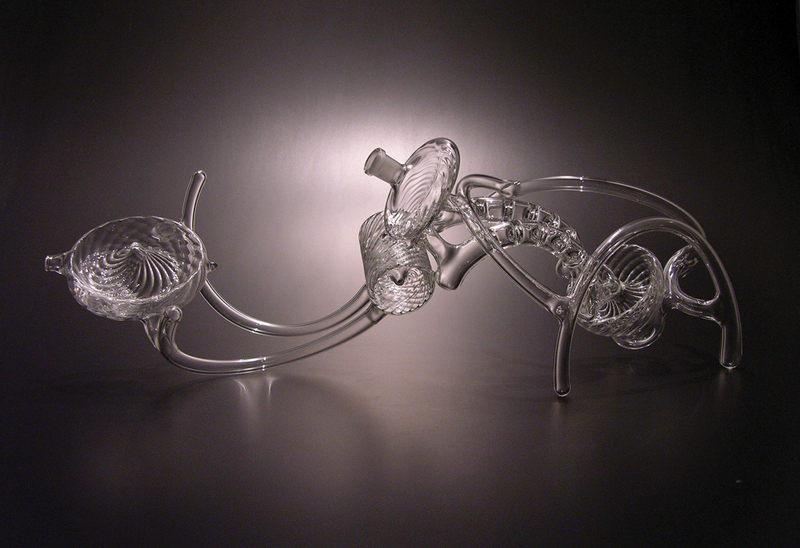 Stretch (2010) links the bowl to the mouthpiece via a series of serpentine passages. 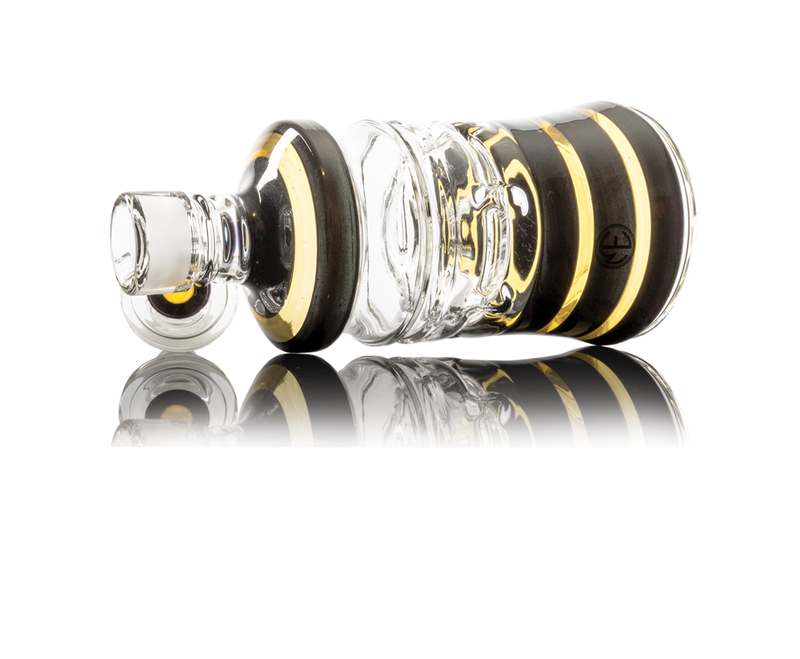 Banded (2016); Evans recently began making high-end liquor bottles. Like his pipes, the bottles bring new polish to an age-old vice. Evans thinks the pipe-making industry will grow as marijuana is legalized in more places. “There’s a different generation of people that no longer think it’s taboo,” he says. Yoyo (2010) brings to mind a hanging plant. 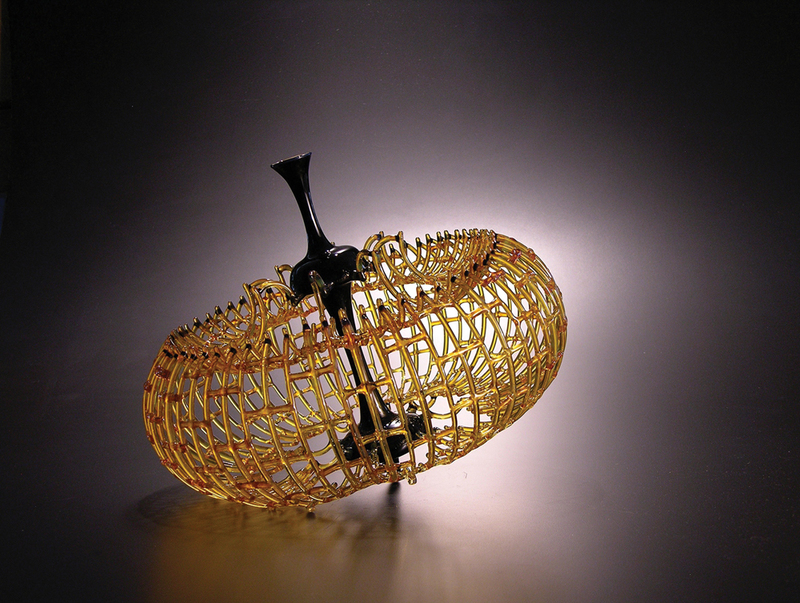 Though he devotes most of his time to functional pieces, Evans also creates sculpture, such as 2013’s Amber Buttress. It’s a labor of love; “I try to keep money out of the fine art side,” he says.